I’ve spent the last few weeks writing a first draft of a thesis chapter on Audiosurf and Slave of God. The point of the chapter is to find a way to talk about sights and sounds in videogame experience beyond some kind of reductive way that sees them secondary to ‘interactivity’. The point of the Slave of God section in particular is to highlight the really direct experience the player has with audiovisual design in that game, where looking and listening are really direct engagements with that game beyond and largely separate from what the player is ‘doing’ at any given time. intensity of feeling in order to create an experience that is in a way ‘truer’ than a photorealistic representation might be”. Which really gets to the heart of why I find Slave of God so interesting: it’s a game about simulating a certain real feeling rather trying to depict some kind of realistic space. SO. Slave of God is about going to a nightclub. You start with this really basic, minimal, kinda chill menu screen which is just a throbbing orange circle. 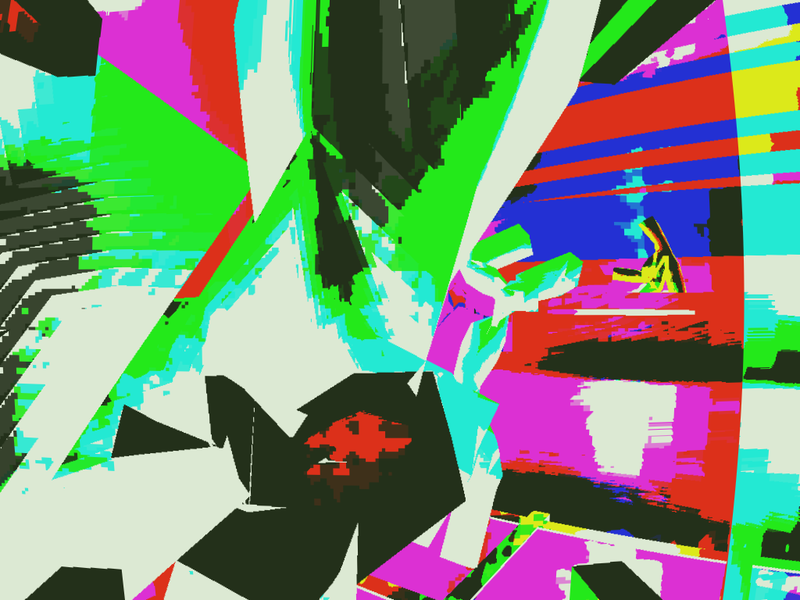 You click on it and after a moment the game loads and you’re just smashed in the face with this barrage of noise and colours. 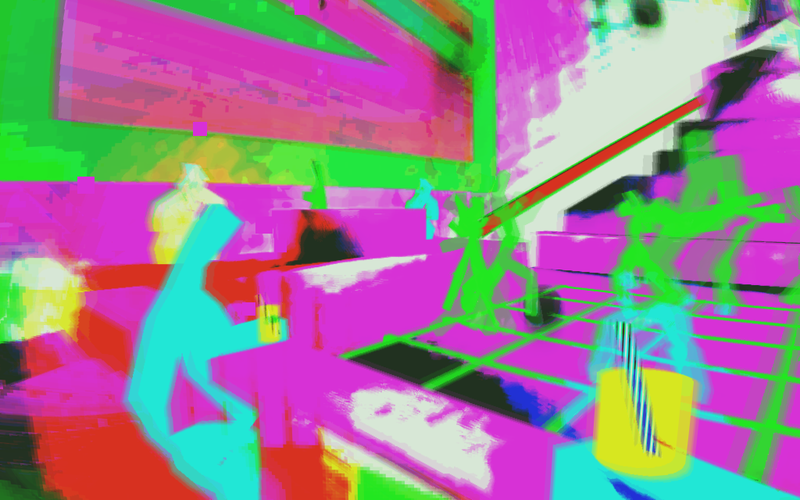 I’m not sure exactly how Stephen Lavelle created these effects, but the result is something like putting on 3D glasses and looking at an analog television tuned to the wrong channel while trapped in some weird dimension where everything consists of watercolour paint and it is raining. Lines and textures throb over adjoining walls but don’t shift with perspective, as though the three dimensions of this space are irrelevant to them. The colours of people and cups of alcohol and dancefloors smear and blur in the spaces around them. The music is a simple, looping, dance-y track that morphs and twists into different melodies depending on what part of the nightclub you move to. Movement is key. Movement is all you have, really, and it’s in movement, trying to move, and trying to figure out how to move that the game best captures that feeling of being lost and confused and disorientated in a club. Since the colours and lines and flashes and strobing lights have little to do with the dimensions of space, trying to move around is incredibly difficult. You bang into walls and look at your feet and end up in the bathroom when you were trying to go to the dancefloor. You get to the dancefloor and you end up dancing with the stranger and the camera locks onto them and you can’t escape because the buttons you would use to strafe and get away just spin you around and around and around and any sense of space you did have just falls from your grasp. Suddenly you’re on the stage with the DJ. Or suddenly you’ve fallen off a ledge onto the bouncer guarding the VIP room. Or you’ve just slipped off the dancefloor on the opposite side of the club than you thought you were on. I hate the vast majority of clubs. I can’t stand the terrible remixes they play, mostly. When I turned 18 and started drinking and going to these places like you are meant to do at 18, they all just seemed so terrible. But eventually through friends I found this club in Brisbane called The Depot. It was a bit grunge-y and very hipster-y. Instead of terrible remixes of top 40 songs, they’d just play this great mix of older and newer alternative stuff. B-52s Rock Lobster or New Order’s Blue Monday or Battle’s Atlas or some Yeah Yeah Yeahs or Le Tigre. Just a good mix of songs you really enjoyed that you could just jump around to like some stupid kid. The Depot closed eventually and the DJs moved on and made another club called Common People. Once I jumped off the stage at that place (during Battle’s Atlas, I think. Or maybe Clap Your Hands Say Yeah’s Skin Of My Yellow Country Teeth) and smashed my head on the low concrete ceiling. The point is, we had some pretty big nights. We’d dance a whole heap and then just kind of collapse on these couches in the back corner on the far side of the speakers until 3am. The point of bringing that up is that Slave of God feels like being back in one of those clubs. The same sense of disorientation. The way you have to squint to figure out where the walls are because the darkness and flashing lights have destroyed your retinas. The way you get trapped on the dancefloor. Most of all, there’s this corner you can find in Slave of God you can escape to where the barrage of sound is dampened and the colours aren’t so violent. Behind you, back towards the dancefloor, everything is kind of small and far away and still absorbed in this chaos of colour. Like you have noclipped out of the level and are looking down on it from afar. Just getting to that corner and taking a break because the game is so physically exhausting on your senses couldn’t not feel more like fleeing The Depot’s dancefloor back to the couches and just collapsing at 2am, maybe even sleeping for a bit if the bouncer doesn’t catch you. I’m not sure how exactly you ‘finish’ Slave of God, but eventually you’re one of the last people on the dancefloor and you stagger back out of the club. All the colours and lights and sounds are gone and it’s all just black now. You can’t see the walls at all. You just look at your feet and stagger out just the sun begins to rise into the sky. It’s difficult to talk ‘about’ Slave of God without just describing what it is like to play Slave of God. It’s not a game about intelligible meanings or mechanics or interactions but, as Kopas notes, an intensity of feeling. Trying to describe it in words is like trying to describe a guitar solo or the taste of a meal. It’s just something you experience through your body. You look at it and you hear it and it just kind of overwhelms your senses and it’s pretty special how it does that and you should totally play it. This entry was posted in musings and tagged phd, slave of god by brendankeogh. Bookmark the permalink.